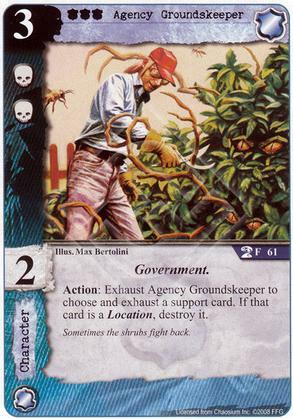 Flavor Text: Sometimes the shrubs fight back. When I first started playing I used this guy a lot but as my card pool expanded he spent more time in the binder. I couldn't justify the 2 skill/icons for 3 cost when his ability only provided soft control over a subset of supports and hard control against a different subset. The recent addition of government synergy makes him much better and the dreamlands reprints make it a good meta to use him in due to all the dreamlands locations.